Located in the heart of historic Llanberis, Y Glyn Afon offers a warm welcome to guests seeking a quiet break without children, in a non-smoking environment. Boasting a 3-star rating from the Welsh Tourist Board, the house lies within the Snowdonia National Park and is just a short walk from the terminus of the famous Snowdon Mountain Railway. 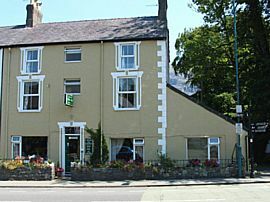 Y Glyn Afon has 8 guest bedrooms, (6 doubles; 2 twins), all with en suite facilities, colour television, alarm clock, hair dryer and hospitality tray. An iron and ironing board are available on request. A hearty breakfast is included in the tariff and is served between 7.45am and 9am. From £22.50 per person in the winter months, to £30 per person in the spring / summer / bank holidays / xmas and new year. Smoking Facilities: Smoking is not allowed. Non smoking thoughout.